That the improving landlords would see Davy as an instrument of more profitable estate activity is not at all obvious, nor do I intend a strict Marxist interpretation here. The improvers were immensely wealthy: the Earl Spencer [1758-1834] hardly needed to interest himself in leather manufacture to secure his position…. The whole issue of using science is much more complex than the question of economic profit. The landowners tended to think in more general terms, and ‘science’ was something of a catch-all to them. Philanthropy, profit and estate activity, and service to the nation seemed to run together quite naturally; and the landowners’ use of science to assist themselves in these matters undoubtedly flattered their image of themselves as active, entrepreneurial, and culturally avant-garde…. The new orientation pressed on Davy [tanning chemistry, agricultural chemistry, etc.] was thus more a matter of attitude and psychology than financial reward. The years to come saw an almost absurd obsession with disinfecting and ventilation, as though crime and chaos could be exorcised by enough chlorine and fresh air; and the Royal Institution was often called upon to arrange the requisite scrubbing and airing. These seemingly progressive changes were thus rooted in a morbid anxiety. The emphasis on external control of the environment, which was a hallmark of modernization, reflected the very real fear that inner control was rapidly slipping away. How could such external control be assured? 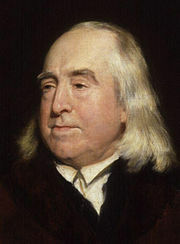 It was this question that brought science and the law together during this time to create what can most accurately be described as a ‘legal ideology of science’, an ideology that received its finest expression in the writings of England’s greatest thinker in the field of jurisprudence and criminal law, Jeremy Bentham [1748-1832]. Although the nature of Benthamism, the exact identity of his followers, and their role in policy-making, have been the subject of much debate in recent years, all are agreed that efficiency and expertise were the two major planks in the Benthamite platform. England, on this view [here, specifically referring to the credo of the Royal Statistical Society], did not have social problems. Rather, it has ‘technical difficulties’, and thus the various facets of the condition-of-England question and the modernization of the nation were scientific matters, amenable to scientific treatment. Thus was born, as a political force, the technological fix. The prevalence of a statistical, technocratic perspective can explain the failure of the British state to use political means to address social problems. It “ruled out any recognition that the ‘technical difficulties’ to be solved by data collection — crime, poverty, disease, pollution, and the like — were endemic to the structure of industrial society rather than ‘unnecessary’ by-products of it” (109). Science in [the Utilitarians’] view was not polite knowledge for an hereditary elite, nor useful knowledge for agricultural improvers (though these were not ruled out), but more importantly a general instrument for creating a smoothly functioning social order. It was the basis for the upgrading of the medical profession and the crux of a new type of legal expertise. Through it, public health might be promoted, forgery prevented, education diffused, pollution curbed, and a modern face for London — bridges, tunnels, housing — constructed. We see [in the RI’s Friday Evening Discourses] ‘the ability of science to function as ratifier of a new world order.’* There was a dual message being delivered at these meetings that was every bit as ideological as Davy’s praise of the agricultural improvers: (1) science has everything under control, and (2) it is you, this particular group of people, who hold this tool in your very hands. In the chaos of the Industrial Revolution, Faraday [as a frequent lecturer] was presenting a comprehensible world, order and stability, with his audience pictured as being in the driver’s seat. Berman’s wariness of science as a path to social progress marks another important divergence from a traditional Marxist approach, which would explicitly aim to use science not only to improve society, but to make society itself more scientific. Instead, Berman draws on Max Weber’s terminology of the “zweckrational” (xviii and 189-190), and holds a false, narrowly framed idea of rationality to be responsible for the evils of “scientific mystification” (188), “the blind scientism of the nineteenth century” (189), “the nuova scienza — what F. R. Leavis has called ‘technologico-Benthamite’ civilisation’…” (185), indeed, “the dominant psychology of industrial society, the pseudo-science of human problems that would reveal its own intellectual poverty if it ever actually managed to confront causes instead of symptoms” (186). *The quote is from Arnold Thackray, “Natural Knowledge in Cultural Context: The Manchester Model,” American Historical Review 79 (1974): 672-709.